WATCH THE ABOVE ANIMATION TO SEE TCVT 10,000 WORK ITS MAGIC! When you need to need to showcase a larger vehicle, The Complete Vehicle Turntable 10,000 will get the job done. 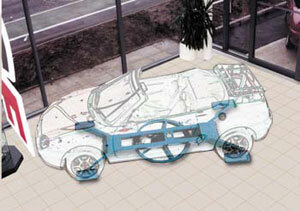 Virtually invisible in operation, this low profile vehicle turntable has an almost magic effect. 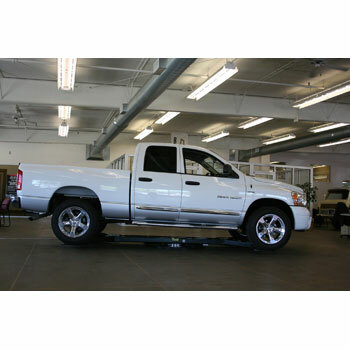 TCVT 10,000 is designed to allow vehicles as large as a 10,000lb 4x4 truck to spin just hovering slightly off the ground while hiding underneath. It creates an elegant, compact display, is extremely portable requiring no floor fixing, and can be used almost anywhere, even outdoors. TCVT 10,000 is always moving. 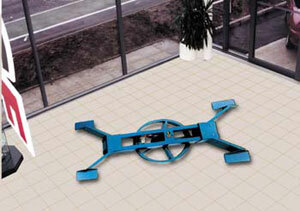 The Turntable is powered by any 120 volt outlet by a cable that is provided. However, if there is no 120 volt available, the turntable can be easily powered by the Truck's battery using a simple 24V to 120 volt inverter (not supplied). The turntable is fitted with an outlet that spins with the table to allow additional lighting or electric devices used to highlight the vehicle's features. Safety is paramount, which is why the turntable, running at .6 RPM, has been designed to stop immediately upon the slightest of obstructions. The unit can typically be set up by two people in about 45 minutes. If your salesmen aren't moving around the lot to move vehicles, bring in TCVT 10,000 "the silent salesman." He just sits there like the rest of your sales team, but you don't have to keep an eye on him, because he moves cars all day without even being seen. The Complete Vehicle Turntable 10,000 will sell for you in the showroom, out in the lot, at tent sales or car shows, inside malls, or out at the county fair...You get the picture. 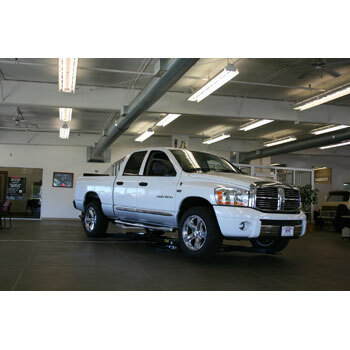 Vehicles are more attractive when in motion, and TCVT 10,000 doesn't require any training. Just give him power and he'll give you the power to sell more. e eye is naturally attracted to movement, and TCVT 10,000 will demand the attention your automobile desires. Portable Turntable: No floor fixing required. 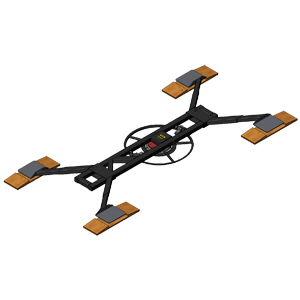 Tears down and transports easily for setup in multiple locations. Typical setup and loading time for two people: 45 minutes. Electrical Power Options: Main 110v power or battery operated. Supplied with a mains lead, TCVT 10,000 can also be operated from the 12v carcar battery itself – ideal for external exhibitions or where trailing wires could pose a problem. Additional slip rings enable electrical power for car interior illumination etc. Unique Safety Clutch: stops the turntable in the event someone touches the vehicle while it is turning. 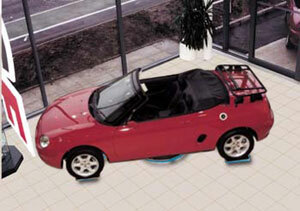 Highlights Product Not Turntable: Virtually invisible, electric rotating vehicle display. Smooth Running: at 0.6 revolutions per minute. 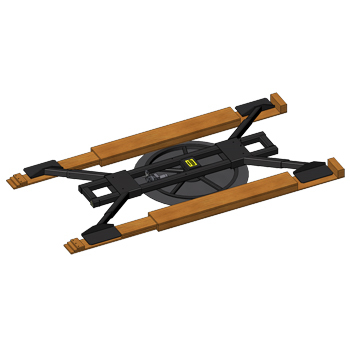 Robust & Reliable: Handles vehicles up to 10,000lbs in weight. This is a picture of how your TCVT 10,000 will be shipped to you. Please read the Shipping Details section below for more information about our shipping procedures! The Complete Vehicle Turntable 10,000's weight is over 1300 LBS. If you have any questions regarding shipping procedures or would like more information on this equipment, PLEASE CALL US AT 1-888-736-5094! This product will be shipped by common carrier. 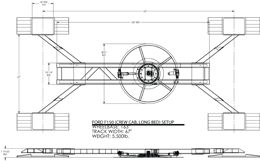 For more information about how this item will be shipped to you, it is always best if you call us at 1-888-736-5094 to get a shipping quote and review Complete Hydraulic's shipping procedure for this Vehicle Turntable with one of our sales associates. For residential deliveries, the customer's address must be able to accomodate a large 18 wheel truck pulling into and out of the drive. THE CUSTOMER IS RESPONSIBLE FOR UNLOADING THE PRODUCT FROM THE TRUCK! * Liftgates are available. Residential charges may apply. PLEASE NOTE: Truck companies may place a reasonable time limit on how long customers are allowed to take before charging extra fees - please ensure you are prepared & ready to unload your equipment when the truck arrives. *For customers unable to accomodate a large truck at their residential address and have no business address available, we STRONGLY urge them to have their product shipped to a local trucking terminal. The terminal staff will be able to unload the equipment from the truck and onto a truck or flatbed trailer for you at no additional cost, and then you will be able to unload the equipment with no time constraints. Indiana residents must add sales tax of 7% to your final cost. We have great freight rates! 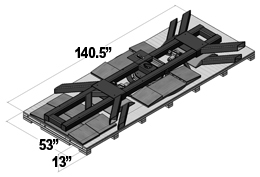 Any Four Post Lift Equipment will be delivered by the the best priced trucking company possible at the time of purchase.